Our 9-Inch Medium-Duty Surface Bolt is traditionally styled with a large round knob and shapely guides. 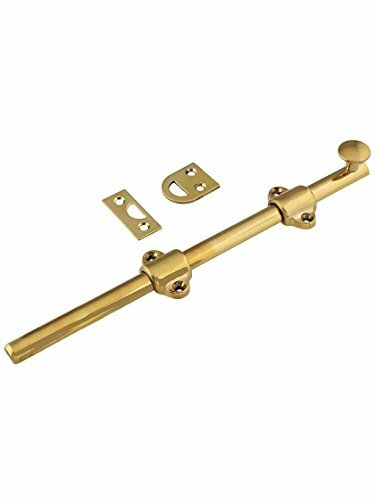 Finely crafted from solid brass, it features tension springs at the guide to hold the bolt open or closed, while a plush felt lining prevents scuffing when operated. Ideal for windows, French doors, and doors, it comes complete with two strikes. Dimensions. Bolt: 9" L x 1/2" W. Projection: 1". Mounting brackets: 1 7/16" W. Throw: 1 1/8". Strikes: Mortise. 1 1/2" L x 5/8" W. Lip. 1 3/16" H x 1" W.
If you have any questions about this product by B&M Hardware, contact us by completing and submitting the form below. If you are looking for a specif part number, please include it with your message.